There were really only three kinds of cake that I ever remember my momma being fond of–her own Coconut-Pineapple White Cake with Seven Minute Icing, the gooey coconut, pecan goodness of her sister Mattie’s German Chocolate Cake, and our neighbor Mrs. Burnett’s Red Velvet Cake with Ermine Frosting. As for me, I dearly loved my mom’s cake, was delighted with Mattie’s, and totally fascinated by Mrs. Burnett’s moist, bright, cherry-red creation with its sweet, creamy, white frosting. 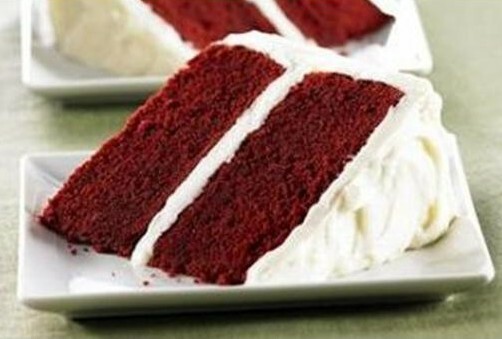 No one knows the Red Velvet Cake’s true origin, although there are numerous urban legends and myths on the subject. One of the more popular of these tales is that it was invented in the 1920s by a chef at the Waldorf-Astoria Hotel in New York City. However, an examination of the hotel’s menus from that era fail to support the claim. And the one about the hotel’s guest asking for and receiving their red velvet cake recipe, along with a bill for $300, resonates those Neiman-Marcus and Mrs. Field’s cookie recipe legends, therefore lending no credence to that tale. As for the story that the Adams Extract & Spice Company of Gonzales, Texas created the recipe in the 1940s to promote its red food coloring, evidence shows this marketing ploy actually transpired some twenty years after the first red velvet cake recipe was published. Therefore while almost certainly adding to the cake’s national popularity, they were obviously not its creator. 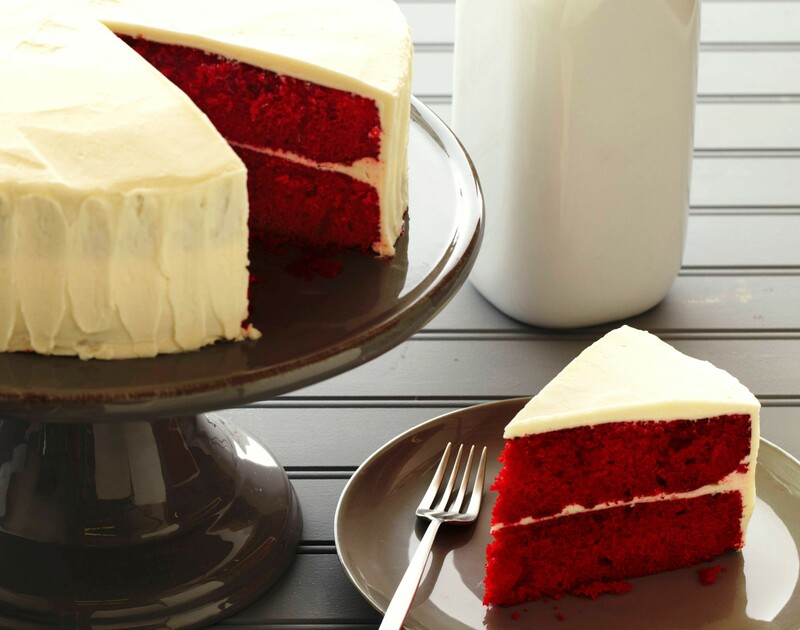 What we can be relatively sure of is that the red velvet cake, as with many other layer cakes, is most likely a product of America’s southern states, where it is thought by some to have originally gotten its color from beets. Others believe the reddish color of those first cakes was created by the chemical reaction realized when combining sour milk or buttermilk, non-alkalized cocoa of that day, and baking soda. But neither of these methods brought about the bright scarlet hue of later cakes enhanced with red food coloring. The first verifiable record of the artificially colored cake as we know it was May 1959, when the News-Journal in Mansfield, Ohio published a recipe for “Waldorf (Red) Cake.” But it was the next year when “red velvet” cake mania started spreading across the country. In 1960 Foodland Supermarkets in Seattle, Washington advertised the availability of “Waldorf Red Velvet Cake” in their store bakeries. That same year William Baker took first prize at the Maryland State Fair for his “Red Velvet Cake.” The Denton Record-Chronicle published “Red Velvet Cake” as its Recipe of the Week on June 16, 1960, and Eaton’s Department Stores in Canada announced it’s newest product line–“Eaton’s Red Velvet Cake.” Magazines, newspapers, and cookbooks everywhere were featuring Red Velvet Cake recipes. In 1976, the FDA banned the very popular Red Dye No. 2 because of unverifiable suspicions that it could create cancer in humans. This caused many housewives to stop buying or making anything using red food dye, and the popularity of red velvet cake all but died. Then, thirteen years later, Hollywood released the award-winning movie Steel Magnolias. In the movie was an armadillo-shaped red velvet groom’s cake, and the once favorite but forgotten treat was suddenly reborn. 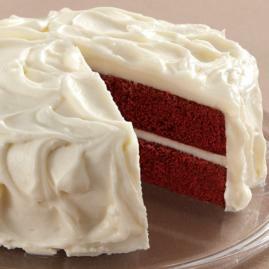 When properly prepared, red velvet cake is soft and moist, with a light texture and fine, tender crumb. The flavor is slightly tangy (brought about by the recipe’s use of buttermilk and vinegar), slightly sweet, with the distinct but subtle hint of cocoa. And it is bright, bright crimson, which requires a lot of red food coloring. The red velvet cake is perfect for Christmas, Valentine’s Day, or any special day where making a distinct impression counts. Oh, did I mention the icing used for this spectacular culinary delight? Well, it was originally not of the cream cheese variety so widely promoted today. Instead, red velvet cakes were originally finished with ermine frosting, a French-style butter roux icing–light, smooth, soft, and creamy, much like butter creme but with slightly more body. It seems that cream cheese frosting didn’t become popular until the mid to late 60s, a few years after the red velvet cake was invented. And while I personally like cream cheese frosting, it belongs on carrot cake, gingersnaps, zucchini cupcakes, and yes, to some people’s liking, red velvet cake. As for myself, I prefer red velvet cake covered with fluffy white ermine frosting, just like the cakes our neighbor Mrs. Burnett use to make.